The winter session, which started on December 15 and concluded today on January 5, had 13 sittings spread over a period of 22 days. Both the Houses were adjourned sine die today. 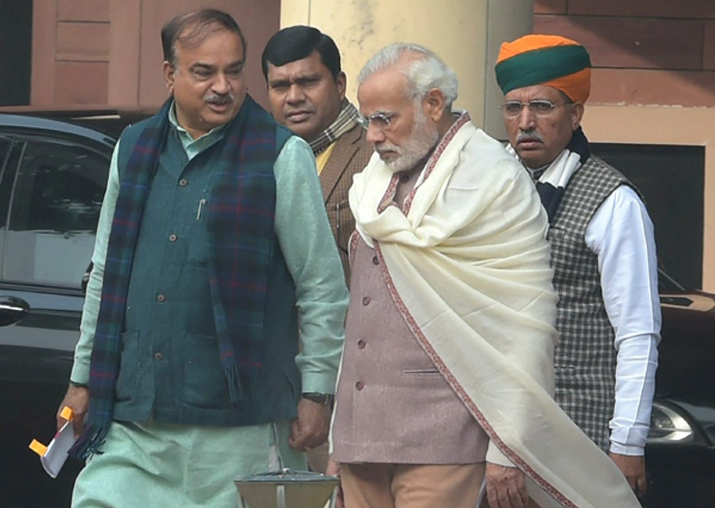 The productivity of the Lok Sabha was 91.58 per cent while that of Rajya Sabha was 56.29 per cent in Parliament's Winter Session which concluded today, Union Minister Ananth Kumar said here. "In a way this session was landmark... 13 bills were passed in the Lok Sabha and nine in the Rajya Sabha during the 13 working days of the Winter Session," the parliamentary affairs minister told reporters. During the session, 17 bills were introduced and 12 bills were passed by both the Houses. "I am grateful to all the parties and all members of both the houses for making this session fruitful," Kumar said. Replying to a question on the bill criminalising Triple Talaq which could not be passed by Rajya Sabha in the session, Kumar blamed the Congress for stalling the crucial legislation and alleged that the opposition came up with a new excuse everday to defer its passage.